Many thanks to Maddie Grant for including me in her list of “Fearless Female Bloggers”! As I mentioned in my comment, this just motivates me to keep raising a ruckus when I see something that needs to be addressed that — for all kinds of reasons — no one else in the association learning world seemed to want to poke a stick at. And congrats to Maddie for making the “original” FFB list at Adria Richards’ Kikolani.com blog! Cyber Monday = 25% Off the aLearning Trail Guide! All orders received before 11:59 p.m. PST today (Monday, November 29) are 25% off (up to $185… don’t I wish someone would order that many books!!). Just click the Buy Now – Lulu blue button on the left to find out more about the book and begin the ordering process. When you are ready to check out, type CYBER25 in the Code field to receive your discount. It’s that easy! Either way, it’s what Lulu is calling their best deal of the year, and on top of the already reduced price of the book, it’s a bargain for the 270+ pages of step-by-step activities and checklists that will guide you from start to finish in developing a workable elearning plan for your association or non-profit. Please note that Lulu prints copies as orders are received. This means delivery on or by a particular date cannot be guaranteed. See www.lulu.com for more information about shipping and delivery schedules. Many thanks to Christopher Pappas at “eFront: News from the e-learning frontier” blog for including the aLearning Blog in his list of “The Most Updated and Popular E-Learning Blogs”! If you’re looking for more resources to add to your PLE (Personal Learning Environment) on all topics related to elearning, see this eFront blog for recommendations that will keep you busy for hours! 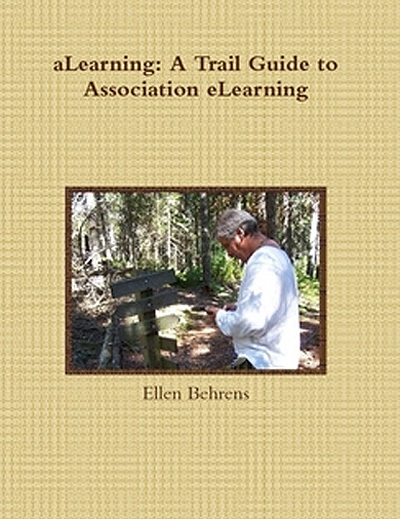 Thinking of purchasing print copies of aLearning: A Trail Guide to Association eLearning? Now’s the time! Lulu is offering FREE shipping on orders of $50 or more TODAY ONLY! Click the “Buy Now” button on the left to start the process. When you’ve completed your ordering information, type GROUNDFREE in field for Code, and the order page will refresh to subtract your shipping fees. As ever, if you have any questions about the book, please feel free to contact me directly! Is Dilbert Buying an LMS?! ?